Weatherproof poly vinyl chloride for harsh outdoor conditions. Bright, fade-resistant color for maximum visibility. Constructed of non-adhesive, non conducting vinyl. Used in applications such as construction, landscaping, excavating, identification of trees or hazards, and locating underground cables or pipe. 1-3/16" wide, 2 mil thick. Weatherproof poly vinyl chloride for harsh outdoor conditions. Bright, fade-resistant color for maximum visibility. Constructed of non-adhesive, non conducting vinyl. Used in applications such as construction, landscaping, excavating, identification of trees or hazards, and locating underground cables or pipe. 1-3/16" wide, 2 mil thick. Level is lightweight, very durable with a flat base for surface leveling. Accurate with a clear 360 degree vial. Weatherproof poly vinyl chloride for harsh outdoor conditions. Bright, fade-resistant color for maximum visibility. Constructed of non-adhesive, non conducting vinyl. Used in applications such as construction, landscaping, excavating, identification of trees or hazards, and locating underground cables or pipe. 1-3/16" wide, 2 mil thick. Weatherproof poly vinyl chloride for harsh outdoor conditions. Bright, fade-resistant color for maximum visibility. Constructed of non-adhesive, non conducting vinyl. Used in applications such as construction, landscaping, excavating, identification of trees or hazards, and locating underground cables or pipe. 1-3/16" wide, 2 mil thick. Weatherproof poly vinyl chloride for harsh outdoor conditions. Bright, fade-resistant color for maximum visibility. Constructed of non-adhesive, non conducting vinyl. Used in applications such as construction, landscaping, excavating, identification of trees or hazards, and locating underground cables or pipe. 1-3/16" wide, 2 mil thick. High impact ABS plastic. Easy to read vial. Durable open hooks to slide on the line. Allows you to level and layout string and can be used on chalk reels to snap a level line. Designed to provide multi-directional leveling. Durable, molded frame. Easy to read. Durable level vial is impact resistant. Lightweight construction reduces line sag. Unrestricted hooks allows for easy movement on line. Used for masonry, landscape and sheet metal work. Model 595 features "Multi-Pitch" vial reads slope in 1/8" increments. ABS high impact resistant case. Lightweight, contour grip, Hi-Viz orange case is easy to find and fits comfortably in hand. Slide lock design allows for easy control of tape blade, wide base helps keep tape standing upright, removable belt clip and easy-to-read yellow clad blade (not replaceable). Provides dependable detection of wall studs. Magnet works by locating steel nails and screws used to hold drywall to studs. Base of the stud finder is notched for convenient marking once studs are located. Stainless steel with depth gauge pocket clip. 32nds and 64ths on one side, decimal equivalents on reverse. 15/32" wide. Manufactured of high-grade, tempered aluminum and silver anodized for long life. Graduations are screen-printed on one side with black, thermal-bonded epoxy ink. Graduations-1/8'', 1/16''. High impact frame is non-conductive and non-corrosive with V-groove edge fits on pipe and conduit. Magnetic edge holds to ferrous metal surfaces (model 7500M). High visibility on job site (models 7500-ORANGE). Heavy duty brass flush mounted thumbscrews. Used for repeat angle cuts for stairs and rafters. Attaches to all standard framing and carpenter squares. High-impact body with V-Groove edge that fits on pipe and conduit and durable acrylic vial reads level. Strong magnetic pickup tip and metal pocket clip. Lightweight construction minimizes line sag. Unbendable open hooks allow level to slide freely. Pocket clip will guard tool against loss. Trim and lightweight metallic colored ABS case with durable key ring for convenience. Yellow, blade lacquer-coated for added rust protection, slide lock keeps blade extended as needed. This 9 inch Toolbox level has 3 easy to read vials (horizontal, vertical and 45 degree) with a V-Groove conduit and magnetic base making it handy for any simple leveling jobs around the home or office environment; a must for those everyday tasks. Durable nylon coated blade. ABS plastic housing with comfortable rubber shell grip. Made from brass-plated steel with a hardened-steel pin. The Compass has a jaw capacity of 8" in diameter and a full-length, hardened steel pin for scribing and stability. Wing nut adjustment up to 8". Used for marking contours and circles. Pencil not included. High impact frame is non-conductive and non-corrosive with V-groove edge fits on pipe and conduit. Magnetic edge holds to ferrous metal surfaces (model 7500M). High visibility on job site (models 7500-ORANGE). Lightweight, durable aluminum hexagonal body construction reduces line sag. Unrestricted hooks allow for easy movement. Used for masonry, landscape and sheet metal work. Aluminum construction is lightweight and durable with flat base for surface leveling. Special hang hooks grip line which enables level to slide freely for positioning; 360 degree vial for easy readability. For locating and transferring any angle from 0 degree to 360 degrees. Heavy duty adjustable stainless steel blade will not rust or corrode, a recessed grip in the handle. Easy-to-use wing nut for positive blade lock. Durable level vial is impact resistant. Lightweight construction reduces line sag. Unrestricted hooks allows for easy movement on line. Used for masonry, landscape and sheet metal work. Model 595 features "Multi-Pitch" vial reads slope in 1/8" increments. Easy to read vials. Durable open hooks to slide on the line. Aluminum construction. Line level allows you to level and layout string and can be used on chalk reels to snap a level line. Easy attachment to any rafter square. Use for angle cuts on rafters, or stair stringers. Can also be used as security stops on window or door metal channels. Durable, lightweight "Structo-Cast" high-impact molded frame; permanent molded graduations for quick and easy measurements; thick edge is useful as a saw guide. Fluorescent orange color is easy to see. Durable molded body with rugged acrylic vials read plumb and level simultaneously. Reflective backing increases vial visibility. Rubber strap allows hands free use quickly attaches to any post, pole or stringer. Functions as a torpedo level and angle finder. It has many of the same features as the one and only Speed Square, but is constructed of lightweight high-impact composite. Center line guide for locating center of round stock, bulit in block level that is easy to read from all angles, and a beveled edge for ease of reading. ABS plastic housing with comfortable rubber shell grip. Comfortable rubber coated thumb lever. ABS plastic housing with comfortable rubber shell grip. Comfortable rubber coated thumb lever. High-impact ABS; top-reading feature allows visibility from above; tinted 360 degree vials for readability; high visibility orange body. "EZRead" permanent thermal bonded numbers and 1/16", 1/8" graduations; rugged steel construction with low glare, anti-rust powder coating. Heavy duty stainless steel blade will not rust or corrode. "Structo-Cast" handle is durable and light weight; 1/8" increments. Scribes accurate circles up to ten feet in diameter or larger, constructed of durable molded nylon. Use a 1/2" outer diameter dowel rod, PVC or rigid metal tubing as the beam. Used in applications by contractors or for DIYers. Made in USA. ABS plastic body holds up to heavy-duty use; versatile layout tool works as a rafter square, try square, protractor or power saw guide. A practical tool for measuring and duplicating difficult angles where a standard protractor or t-bevel cannot fit. The Protractor works on outside, inside and sloped angles from 0 to 165 degrees. The four-piece design adds additional versatility for measuring particularly difficult angles. Fine black graduations from 0 degree to 80 degrees in opposite directions. Brass lock nut. For finding a plumb (vertical) line over a long distance. Removable cap for quick, easy and accurate centered string installation. Perfect tool for when you need a lightweight easy to use rafter square; use for marking and cutting of rafters, stairs or any basic angle; all gradations are molded-in so they will not wear off during repeated use; durable, lightweight, ergocast material; molded-in conversion tables; easy-to-read gradations marked with precise cutting angles base enables easy marking and cutting. Non pressure sensitive vinyl. Yellow tape with (WET PAINT) black lettering; 3" wide, 3 mm thickness. Folds closed, opens flat; click-lock every 15 degree; adjustable elastic strap for non-magnetic surfaces; 4 powerful magnets for metal surfaces. Instant template for marking precise ceramic tile cuts. No rust plastic conforms to shape and holds pattern. Lightweight, contour grip, Hi-Viz orange case is easy to find and fits comfortably in hand. Slide lock design allows for easy control of tape blade, wide base helps keep tape standing upright, removable belt clip and easy-to-read yellow clad blade (not replaceable). Robust scribing and marking tool with a jaw capacity of up to 9". The fulcrum spring handle makes this tool great for making contours, circles and edge marks. Made from durable die cast metal with scribe guide for edge marking. For use with pencil (included) or slim ball-point pen. Stainless steel blade with permanently stamped graduations 1/8", 1/16", 1/32" with heavy duty "Structo-Cast" molded head. Reversible head with lock bolt and steel screw. Durable acrylic level vial. For finding a plumb (vertical) line over a long distance. Removable cap for quick, easy and accurate centered string installation. Slim, metallic-colored ABS case fits perfectly in a pocket. Back of blade provides scale that measures up to 3' diameters; special Tru-Zero hook does double duty as a pivot for drawing circles and arcs Heat-treated spring stands up to regular use; Polymer-coated blade for long life. Used for marking angles, for cutting rafters and for scribing lines. Also can be used as a protractor and saw guide. Easy to read measurement scales and durable engineering. Permanent deep markings. High visibility orange color. High impact, high-visibility yellow case stands, High-contrast blade for easy readability with a 7' standout. Reusable 18" x 18" safety load flag with connecting device; meets all DOT regulations for oversized loads; greener product it's reusable; durable weather resistant long lasting; great for all contractor's and diyer's; just wrap it, snap it and go. Ideal for layout jobs. Allows you to plumb and level posts, poles, pipes, railings and more. Durable molded frame. Magnetic strip and rubber strap for hands free work. Lightweight aluminum body with durable plastic handle. Can be used to lay out 45 and 90 degree angles; 8" blade with embossed 1/8" graduations. Durable stainless steel blade with built-in blade lock for transferring angles. Tough 5-1/2", plastic handle provides handy, comfortable grip. Durable, shock-resistant ABS construction. Top read center vial designed for instant readability. Measuring scale adds utility. Non marring material will not damage finished surfaces. High visibility yellow is easy to spot on the job site. High impact, high-visibility yellow case stands, High-contrast blade for easy readability with a 7' standout. High-quality hardened steel for durability and long life. Embossed graduations for easy reading on face and back; 1/8" graduations on face and back. Reverse reading scale makes measuring more efficient. Treated with a clear, protective finish that resists rust. 50 series. 3 vials with plumb, level and 45 degree readings. ABS frame for a strong, impact resistant body. Rare magnets allow for easy hands free steel construction work. Use for quick and accurate measuring of rafter and angle layout. Includes: instruction booklet. Used for laying out and marking angles in framing, roofing and stairway work. Also can be used for checking squareness and flatness. Aluminum reinforced frame with high impact panels, V-groove frame that fits on pipe and conduit. Magnetic edge holds to ferrous metal surfaces and durable acrylic vials. Precision made, with etched fine black graduations, on stainless steel finish. Side 1: 10, 100, side 2 :-32, 64. Power return feature, with automatic bottom lock, streamlines tape operation. Yellow, high visibility case with belt clip on back. Special Tru-Zero hook does double-duty as a pivot for drawing circles and arcs. Polymer coating and heat-treated spring extend life. Pocket size ideal for office or home. High strength black case. Yellow clad blade is flexible with bold graduations on yellow background. Black markings one side only. Consecutive inches to 1/16ths bottom edge, first 12" to 1/32nds; 16" centers designated by diamond; every 12th inch in red. One-piece with closed end, lightweight, high-impact, foam-mold polystyrene construction. Large, highly visible 3-position vials with snap-on black vial covers; easy to replace. High visibility Glo frame with convenient hand holes. High-quality hardened steel for durability and long life. Black 1/8" embossed graduations for easy reading on face and back. Reverse reading scale makes measuring more efficient. Treated with a clear, protective buff finish that resists rust. Features a solid aluminum cast body with exclusive CNC machined edges, permanent molded gradations, and a low-glare, protective coat finish; thick edge is useful as a saw guide; continuous scribing notches ideal for ripping at 3-1/2" and 5-1/2". Can also be used as a ruler or can be used to measure angles. The diagonal edge has markings for laying out rafters, roof trim, and stair angles. Lightweight, high strength, Hi-Viz orange case easy to find on the job; fits perfectly in the hand and into most tape holsters. Bright yellow blade has clear easy-to-read numerals with cushioned blade return. Removable belt clip. Toggle lock is positioned for convenient operation and holds the blade securely. Lightweight and durable, foam cast high-impact plastic; three easy to read vials (horizontal, vertical and 45 degree); unique vial-lock mechanism; ergonomic hand grip. Entire blade coated with heavy-duty Mylar polyester film for unbeatable durability. Two-rivet, corrosion-resistant hook stands up to continuous use. Special Tru-Zero hook does double-duty as a pivot for drawing circles and arcs. Die cast metal case. Solid heavy duty aluminum extruded square will not bend, break, rust or corrode, stamped conversion tables and thick edge makes for a safer saw guide. Functions as a framing square, try square, miter square, protractor, saw guide, stair gauge and out-of-square corner angle finder. It's constructed of lightweight high-impact structural composite. This tool can be used with siding and other delicate materials, since it won't mar softer finishes and larger body covers more material, centerline for determining center of round stock, and a beveled edge for ease of reading. Includes: 60-page Swanson Blue Book and layout bar with hardware. Magnetic working edge allows for hands-free use on ferrous metal surfaces; oversized aluminum reinforced frame; "SurroundView" vials reflect ambient light for easy-read; V-groove frame fits on pipe and conduit; top-read window for easy viewing; tapered design fits in tool pouch or pocket. Embossed hard-chrome blade is coated to resist rust. Easy-to-read vial. Lightweight, plastic handle. Functions as a torpedo level and angle finder. It has many of the same features as the one and only Speed Square, but is constructed of lightweight high-impact composite. Center line guide for locating center of round stock, bulit in block level that is easy to read from all angles, and a beveled edge for ease of reading. Polished lacquer, solid brass construction with replaceable, hardened steel tip. Screw top simplifies attaching string to center of plumb and thru hole ensures easy tightening; durable and rust resistant. Heavy duty vinyl with 2" black characters (CAUTION) on 3" wide yellow tape. Bright colors for maximum visibility. Durable compounds resist fading; each flag is 2-1/2" x 3-1/2" x 21". Power return feature, with automatic bottom lock, streamlines tape operation. Yellow, high visibility case with belt clip on back. Special Tru-Zero hook does double-duty as a pivot for drawing circles and arcs. Polymer coating and heat-treated spring extend life. Permanently stamped numbers and 1/8" graduations. Durable protective epoxy finish to prevent rust; 1/16" thick. "EZRead" permanent thermal bonded numbers and 1/8", 1/10", 1/12", 1/16" graduations;octagon scales, rafter tables and board foot tables; rugged steel construction with low glare, anti-rust coating. Precision machined head and true bluevials ensure squareness to .001. Etched stainless steel blade with inch graduations. Machined square head self-aligning drawbolt and a hardened scriber. Pocket size ideal for office or home. High strength black case. Yellow clad blade is flexible with bold graduations on yellow background. Black markings one side only. Consecutive inches to 1/16ths bottom edge, first 12" to 1/32nds; 16" centers designated by diamond; every 12th inch in red. High impact, high-visibility yellow case stands, High-contrast blade for easy readability with a 7' standout. Heavy duty aluminum frame; Bi-material body with rubber ends for shock absorption and non-marring feet. Pipe groove makes it a good choice for use on rounded surfaces. Magnetic strip allows for hands free operation on metal surfaces. Water resistant for use in wet or humid conditions. Entire blade coated with Mylar polyester film for durability. Heat treated spring stands up to repeated usage, positive blade lock won't creep, graduated in 16ths of an inch. Special Tru-Zero hook does double-duty as a pivot for drawing circles and arcs. Belt clip on back of case. High impact, high-visibility yellow case stands, High-contrast blade for easy readability with a 7' standout. High-impact plastic; top reading feature allows visibility from above; tinted 360 degree vials make reading easy on the eyes. Durable bi-material case with belt clip. Self locking blade with fractional read blade graphics, magnetic end hook and Tru-Zero hook for accuracy. Lightweight, contour grip, Hi-Viz orange case is easy to find and fits comfortably in hand. Slide lock design allows for easy control of tape blade, wide base helps keep tape standing upright, removable belt clip and easy-to-read yellow clad blade (not replaceable). Steel construction with clear, anti-rust coating that will not rust or corrode. Permanently stamped numbers and 1/8", 1/10", 1/16" graduations; board foot tables and rafter tables. Used in general carpentry and for laying out rafters and stair stringers. 10" level featuring Plumb Site Dual-view cylindrical vertical vial; 2 easy-to-read vials (horizontal and 45 degree); leveling ledge for tiles/stills; V-groove magnetic strip; tough internal aluminum frame. Functions as a saw guide, for special angle measurements and cuts, or as a protractor. Aluminum construction for durability. Includes: detailed instruction book. Magnetic base and back. Easy reading dial with adjustable angle pointer. Built-in angle pitch calculator on back. Case designed to fit perfectly in the hand. Lightweight, high strength chrome finished case; fits easily into most tape holsters with removable belt clip. Bright yellow blade has clear easy-to-read numerals. Toggle lock positioned for convenient operation, holds blade securely, cushioned blade return. Made of durable ABS plastic; used to obtain or transfer any angle or pitch. Reads 0 to 90 degrees in 2 quadrants. Reads pitch or slope in inches per foot; printed scale to read pitch in inch rise per 12" run without the use of conversion tables. High impact, high visibility yellow case with high-contrast blade for easy readability. Three-rivet, corrosion-resistant hook moves to allow accurate inside/outside measurements; 7' standout. Entire blade coated with Myla polyester film. Heat treated spring stands up to repeated usage, positive blade lock won?t creep, graduated in 16ths of an inch. Special Tru-Zero hook does double-duty as a pivot for drawing circles and arcs. Belt clip on back of case. Delivers accurate measurements up to 1/32". The stainless steel body delivers both Metric and English readings of inside and outside measurements. There is also a decimal equivalents chart printed on the back side for help with calculations. Etched and filled black graduations. Ultra thin fingers measure profiles up to 3-1/2" deep. Includes rule marking on body with inch graduations and stainless steel pins. Used for precise woodworking, installation tile floors or linoleum. Used for adjusting and gauging spark plugs, distributor points and valve clearances, or any other instance of measuring the space between two parts. This 26 leaf gage features straight leaves etched with both Metric and English units, ranging from .0015" to .025" and .037mm to .635mm. Leaves are 3" long and 1/2" wide. The set is housed in a protective holder to preserve the trueness of the leaf edges. Power return feature, with automatic bottom lock, streamlines tape operation. Yellow, high visibility case with belt clip on back. Special Tru-Zero hook does double-duty as a pivot for drawing circles and arcs. Polymer coating and heat-treated spring extend life. Constructed of yellow, non-adhesive, non-conductive vinyl. Added plasticizers for increased elasticity with (CAUTION CONSTRUCTION) printed in large, black, bold print for better visibility; 3" wide. Five tools in one: a tri-square, a miter square, a protractor, a line scriber, and a saw guide. The Speed Square is constructed of durable heavy-gauge aluminum alloy. Includes markings for Swanson's One-Number Method of rafter layout, and is packaged with the Swanson Blue Book of Rafter Length and Roof Construction. Matte finish to prevent glare. Made of ground stainless steel for optimum accuracy. Permanently etched graduations from 0 degree to 180 degrees in opposite directions. Adjustable 6" protractor arm locks into desired position with knurled thumb nut with 3-3/8" x 2" head. Automatic blade lock holds the blade in extended position. Orange ABS case with a non-slip co-molded rubber grip, steel reinforced end hook, durable clear coat blade protection and recessed lock release. Strong solid aluminum frame with V-groove frame fits on pipe and conduit, and magnetic edge that holds to ferrous metal surfaces. "SurroundView" vial surrounds enhance readability. Made of flexible and strong tempered aluminum with a permanently anodized finish. Screen printed black, thermal-bonded graduations in 1/8 and 1/16" on both edges and can be read from either end. One-piece with closed end, lightweight, high-impact, foam-mold polystyrene construction. Large, highly visible 3-position vials with snap-on black vial covers; easy to replace. High visibility Glo frame with convenient hand holes. Rust-proof, chemical resistant and light weight. Used as a depth gauge and for transferring angles. This marker is required by OSHA for perimeter marking of any above ground construction area, flat roof jobs, and open upper-level construction. Perimeter Marker is 105 ft in length and exceeds the 500 lb required breakstrength. Nylon bond blade protection; 5-point reinforced frame; fractional scale; optimized hood designed for scoring; stamped steel belt clip; lanyard ready. Five tools in one: a tri-square, a miter square, a protractor, a line scriber, and a saw guide. The Speed Square is constructed of durable heavy-gauge aluminum alloy. Includes markings for Swanson's One-Number Method of rafter layout, and is packaged with the Swanson Blue Book of Rafter Length and Roof Construction. Matte finish to prevent glare. Constructed of non-adhesive, non-conductive vinyl. Added plasticizers for increased elasticity. Larger, bolder print, (CAUTION), for better visibility; 3" wide, 2 mil thick. Entire blade coated with heavy-duty Mylar polyester film for unbeatable durability. Two-rivet, corrosion-resistant hook stands up to continuous use. Special Tru-Zero hook does double-duty as a pivot for drawing circles and arcs. Die cast metal case. Heavy duty extruded aluminum frame with powerful, V-grooved working edge that fits on pipe or conduit and full length magnetic edge. True Blue vials are accurate to within 0.0005" per inch in all 10 level and plumb working positions. Easy readability, 7' standout, secure blade lock won?t creep. Special Tru-Zero hook does double-duty as a pivot for drawing circles and arcs. Entire blade coated with Mylar polyester film for added durability, heat-treated spring stands up to repeated use, 16" and 19.2" stud center markings. Three-rivet, corrosion-resistant hook moves for accurate inside/outside measurements. Durable, light weight "Structo-Cast" high-impact molded frame with permanent molded graduations for quick and easy measurements, thick edge is useful as a saw guide, built-in scribe notches. Fluorescent orange color is easy-to see. High impact, high visibility, yellow ABS case houses thick, wide yellow blade coated with polymer for enhanced durability; easy-to-read markings. Easy-wind drum ensures streamlined usage. End hook recoils neatly into contoured case. Graduations printed in fractions and decimal equivalents. Rounded blue ABS case fits your hand for comfort and withstands rugged use on the job site. Positive toggle lock holds blade securely at any length. Self-compensating end hook for inside and outside measurements. Built in bumper reduces shock when blade is retracted. Durable, heavy duty, cast aluminum frame with pipe groove for use on rounded surfaces. Magnetic strip allows hands free operation on metal surfaces. Tinted 360 degree vials make reading easy on the eyes. Marked both sides, both edges. Graduated to 1/16ths both edges; 16" stud centers marked in red. Regular outside markings. For rules with inside markings, numbering begins on inside of rule with measurement laying close to work. All Straight Edges are made of high-grade aluminum alloy with high visibility, thermally fused, yellow powder paint finish. Lightweight and strong, with black; thermo-bonded gradations and non-glare finish. Used as a measurement tool and for marking 90 degrees. Rust proof stainless steel blade. Black precision etched scales. High impact ABS handle. Aluminum frame with "Quik-Change" replaceable vial covers. Impact resistant acrylic vials assure accuracy; V-Groove edge. Pocket-size stud sensor detects wood/metal studs up to a 3/4" depth. Easy visual indicators on face of stud sensor for easy readability; LED display and buzzer indicates stud edge. Small and compact, easily fits in pocket; uses powerful rare earth magnets to pinpoint the exact location of screws or nails in a stud and allows hands free use; 2 way level for ease of marking; soft grip for easy grabbing and gentle touch, no batteries required. Stainless steel blade with permanently stamped graduations 1/8", 1/16", 1/32", mm. Heavy-duty cast zinc head with black, chip-resistant e-coating finish. CNC machined square head for greater accuracy. Reversible head with lock bolt and steel screw. Hardened, screw-in scriber won't fall out. Durable acrylic level vial. "Auto-Lock" blade assembly. Lightweight, high strength, Hi-Viz orange case easy to find on the job; fits perfectly in the hand and into most tape holsters. Bright yellow blade has clear easy-to-read numerals with cushioned blade return. Removable belt clip. Toggle lock is positioned for convenient operation and holds the blade securely. For measuring left to right, right to left. Marked both sides. Graduated in feet, inches and 1/16ths on both sides and both edges. Flat inside markings lie close to the work. Universal lightweight long steel tape with high impact polystyrene case. Yellow clad blade .005"/0.13mm thick. Easy wind nylon drum; easy-to-read black and red markings. Hook ring is retained neatly in the contoured mouth of the case. Removable belt clip. Graduated feet and inches to 1/8ths with instantaneous readings; 16" centers indicated by a diamond. Stainless steel blade with permanently graduations 1/8", 1/16", 1/32" with a heavy-duty cast iron head with black finish. Reversible head with lock bolt and steel screw. Hardened, screw-in scriber won't fall out. Durable acrylic level vial. "Auto-Lock" blade assembly. Delivers the same accuracy and precision as some larger models. Compact, stainless steel construction these Slide Calipers provide inside and outside readings in both 1/16" and 1mm graduations. In addition, there is a decimal equivalents chart on the caliper?s back side for help in making measurement calculations. Etched and filled black graduations. Die-cast metal case holds its own against rough handling; entire blade coated with heavy-duty "Mylar" polyester film for unbeatable durability; two-rivet, corrosion-resistant hook stands up to continuous use; special Tru-Zero hook does double-duty as a pivot for drawing circles and arcs. 180-degree rotating vial for a range of situations; measuring scale printed directly on the level eases layout work; heavy-duty aluminum I-beam construction provides rigidity and accuracy; level accuracy of 0.0015" (0.15mm/m); 360-degree vials set directly into frame never need adjustment. Magnetic end hook is a time-saver for framers, HVAC installers, and more. Powerful dual magnets can also serve as a pick-up tool. Orange with a non-slip, co-molded rubber grip, ABS case stands up to the toughest work site. Non-slip rubber blade lock button. Use for one-man measurements of steel framing and drop ceiling grids. Durable bi-material case with slip resistant rubber over mold with belt clip on back of case. AirLock rubber slide lock, multi-catch hook,Tru-Zero hook with nail head slot. Accurate interior and exterior measuring with large, easy to read blade graphics, nail slot for measuring radius, 10' blade standout. A sleek looking, sturdy I Beam level with added unique Plumbsite Dual View Vial feature; one plumb site dual-view vial, two horizontal cylindrical vials, V-Groove base for leveling pipes; sturdy aluminum frame. Magnetic working edge allows for hands-free use on ferrous metal surfaces; oversized aluminum reinforced frame; "SurroundView" vials reflect ambient light for easy-read; V-groove frame fits on pipe and conduit; top-read window for easy viewing; tapered design fits in tool pouch or pocket. Functions as a 0 degree to 90 degree protractor scale as well a saw guide. Durable aluminum construction with black body with yellow graduations provides maximum readability in all light conditions. Heavy duty extruded aluminum frame with powerful full-length magnetic edge. True Blue vials are accurate to within 0.0005" per inch in all 10 level and plumb working positions. Vari-Pitch vial reads slope in 1/8" increments. Precision machined die-cast zinc body with an impact-resistant acrylic level vial and a brass scriber. Also acts as a depth gauge, and has 45 and 90 degree working surfaces. Black precision etchings, brass hardware. High-quality aluminum for maximum durability. Protective lacquered coating resists corrosion. Durable black embossed graduations and figures for easy reading. Provides helpful reference conversion tables such as new lumber scale, decimal equivalent table, metric conversion table, formula for squaring a foundation, 45, 60 and 30 degree angle markings, volume and area formulas, wood screw gauge table, nail sizes (common and finish), quantity per pound and depth scale. Polished lacquer, solid brass construction with replaceable, hardened steel tip. Screw top simplifies attaching string to center of plumb and thru hole ensures easy tightening; durable and rust resistant. Locates the wood or metal studs up to 3/4" deep. Red LEDs light up every time a stud edge is approached. An audio alert and green LED signals when the stud edge is reached. Should scanning begin over a stud, over-the-stud indicator alerts the user to start the scan in a new location. "TruCal" technology calibrates to any wall's density and a steady green LED "TruCal" light alerts the user when the tool is calibrated and ready to scan. Rust proof stainless steel blade. Used for 90 degree and 45 degree marking, as well as marking gauge for transferring measurements. Black precision etched scales. High tempered aluminum for maximum durability with deep and long wearing 1/8" graduations on face and back and a protective lacquered coating resists corrosion. Lumber scale, decimal equivalent table, metric conversion table, formula for squaring a foundation, 45, 60 degree,30#&176, angle markings, volume and area formulas , wood screw gauge table, nail sizes and depth scale. Tables and information imprinted on both sides of square. Designed for estimating board feet in a cut log. Graduated inches to 1/16ths lower edge. Outside markings for 10 and 18' logs; inside markings for 12, 14 and 16' logs. "Drag Strip" finger access for measuring and retraction control; wide end-hook holds better and makes marking easier; new blade design achieves 10' stand-out, make longer measurements; clearcoat blade protection - more durable markings; durable case allows for added control and grip; integrated D-ring for tether strap or easy handling storage; easy on/off belt clip for fast attachment to belt; blade graduated in 32nds for first 12 inches. For finding a plumb (vertical) line over a long distance. High quality plated brass, lacquered with replaceable hardened tips. Removable cap for quick, easy and accurate centered string installation. Well suited for all types of layout and measuring work. The 10' blade standout makes it easy to take those long measurements without the need of an extra set of hands. The blade itself is covered with a protective Mylar coating that helps it resist chipping and cracking. Solid aluminum body for assured durability and precision CNC machined edges for guaranteed accuracy; "EZRead" laser etched graduations and numbers are highly visible; thick edge is useful as a saw guide; continuous scribing notches - ideal for ripping at 3-1/2" and 5-1/2"; low-glare, protective anodized finish. Power return feature, with automatic bottom lock, streamlines tape operation. Yellow, high visibility case with belt clip on back. Special Tru-Zero hook does double-duty as a pivot for drawing circles and arcs. Polymer coating and heat-treated spring extend life. Used for laying out and marking angles in framing, roofing and stairway work. Also used for checking squareness and flatness. Embossed hard-chrome blade is coated to resist rust. Built-in scriber comes in handy for surface marking. Easy-to-read vial. Durable, black die-cast metal handle. Locates wood and metal studs up to 3/4" behind drywall. The "SpotLite Pointing System" shines a beam of light on the wall to identify the target. Red LEDs light up every time a stud edge is approached. SpotLite Pointing System, an audio alert, and a green LED signals when the stud edge is reached. Should scanning begin over a stud, the over-the-stud indicator alerts the user to start the scan in a new location. TruCal technology calibrates to any wall's density and a steady green LED TruCal light alerts the user. Aluminum construction with anodized finish will not rust or corrode. Permanently stamped numbers and graduations in 1/8", 1/10", 1/12" and 1/16"; octagon scales, rafter tables and board foot tables. Used in general carpentry and for laying out rafters and stair stringers. CS7 features laser etched EZ Read graduations and numbers on black anodized body. 150 series. Heavy duty aluminum frame with composite body. Locking dial vial. V-groove edge for leveling pipe. Rare earth magnets allow for easy, hands free steel construction work. Used for marking angles, for cutting rafters and for scribing lines. Also can be used as a protractor and saw guide. Easy to read measurement scales and durable engineering. Durable, shock-resistant ABS construction. Top read center vial designed for instant readability. Measuring scale adds utility. Non marring material will not damage finished surfaces. High visibility yellow is easy to spot on the job site. Features an extruded aluminum frame with anodized finish. Convenient ruled edge screen printed on one side. Top read window allows for easy viewing. 3 durable acrylic vials. Protective end-caps. Ideal level for general around-the-house projects and light construction uses. Has lots of great features that make it easy for professionals and DIYers to take accurate measurements; with a chrome plated case and a polymer coated blade, you are ensured years of heavy duty use. This tape offers 7' standout; it has a multi-catch hook for versatility with a Tru-Zero hook for accurate inside and outside measurements. V-groove edge for pipe and conduit. High impact ABS body. Magnetic base. Rugged rubber over-mold for impact resistance; 10' Blade Standout for reach and efficiency; Tylon blade coating for durability and long blade life; "Tru-Zero" end hook for accurate measurements; high impact case design for durability. Chrome-coated, high impact ABS case with rubber grip for increased durability, high impact resistance and better blade protection. The nylon-coated blades provide extended blade life and increased readability. The true-zero, 3-riveted hook offers superior strength. The positive blade lock and reverse button are standard. All have a handy belt-clip. Perfect for a wide variety of household ad jobsite applications; features 3 different scale configurations; built-in level; handy 3/16" gauge; layout mitered corners; transfer measurements; align/square your projects; set bit/blade heights; layout wall studs; use as a basic rule, story stick, simple level or marking for layout. High impact, high visibility, yellow ABS case houses thick, wide yellow blade coated with polymer for enhanced durability; easy-to-read markings. Easy-wind drum ensures streamlined usage. End hook recoils neatly into contoured case. Graduations printed in fractions and decimal equivalents. Rounded blue ABS case fits your hand for comfort and withstands rugged use on the job site. Positive toggle lock holds blade securely at any length. Self-compensating end hook for inside and outside measurements. Built in bumper reduces shock when blade is retracted. Open four arm frame design protects blade, does not trap dirt in case. Lightweight, strong, easy to handle and rewind, orange case is easy to find and two material grip is comfortable to use. Yellow clad fiberglass blade impervious to moisture. Folding end hook for true-zero measurements. Feet and inches graduated to 8ths; numbered feet and instantaneous feet. Durable cast zinc body. Rust proof stainless steel blade. Used for 90 degree and 45 degree marking, as well as marking gauge for transferring measurements. Black precision etched scales. Easy readability, 7' standout, secure blade lock won?t creep. Special Tru-Zero hook does double-duty as a pivot for drawing circles and arcs. Entire blade coated with Mylar polyester film for added durability, heat-treated spring stands up to repeated use, 16" and 19.2" stud center markings. Three-rivet, corrosion-resistant hook moves for accurate inside/outside measurements. Well suited for all types of layout and measuring work. The 10' blade standout makes it easy to take those long measurements without the need of an extra set of hands. The blade itself is covered with a protective Mylar coating that helps it resist chipping and cracking. Metallic ABS case has a wear plate that protects case from cuts and nicks. BladeArmor coating on the first 6" maximizes durability of hook end, Mylar polyester film extends life of entire blade and improves measurement visibility. Forward blade lock design simplifies locking and unlocking the blade, wide blade for easy readability. Three-rivet, corrosion-resistant hook moves for accurate inside/outside measurements, 16" and 19.2" stud center markings simplify framing jobs, 8' tape standout. PVC blades allow tape to be wound wet and easily cleaned. High impact ABS case for durability, wide blade with easy-to-read fractional/decimal, inch/foot markings. English formats for versatility. Rubber grip is designed with comfort in mind, easy to find yellow color. Useful measurement transfer tool when working with round stock or oddly shaped materials. Hardened and tempered bow springs assure uniform tension without side play. Adjusting screw has self-seating washer and nut for quick adjustments. Legs made from special caliper steel with hardened measurement points. Conforms to government specifications GGG-C-95. Designed for homeowners, do-it-yourselfers, woodworkers, hobbyists, decorators and gardeners; helps you quickly figure project material quantities, linear distances and material costs; helps you design, apply, install and finish your improvements with precision and confidence. Wood and metal stud detection through up to 3/4" deep surface material; AC detection identifies live wires up to 2" deep; sequential LEDs and audible beeps indicate reading; marking channel with LED identifies target and makes marking surfaces easy and accurate; new ergonomic design and soft grip buttons provide comfort and control of the tool. Lightweight, high strength, Hi-Viz orange case easy to find on the job; fits perfectly in the hand and into most tape holsters. Bright yellow blade has clear easy-to-read numerals with cushioned blade return. Removable belt clip. Toggle lock is positioned for convenient operation and holds the blade securely. Hardened and tempered bow springs assure uniform tension without side play. Adjusting screw has self-seating washer and nut for quick adjustments. Legs made from special caliper steel with hardened points. Used in marking circles, tracing contours and transferring measurements. Conforms to government specifications GGG-C-95. Entire blade coated with Mylar polyester film for durability. Heat treated spring stands up to repeated use; 16" and 19.2" stud center markings. Special Tru-Zero hook does double-duty as a pivot for drawing circles and arcs. Three rivet, corrosion-resistant hook moves for accurate inside/outside measurements, secure blade lock won?t creep, 7' standout. Features two front-facing magnets allowing it to easily connect with any metal object as ceiling grids, studs, beams or HVAC ductwork; nylon coated for extra durability; the double sided blade features large 3/8" markings for quick readings of both elevations and flat surfaces; the high visibility scale is graduated in 1/16" increments. 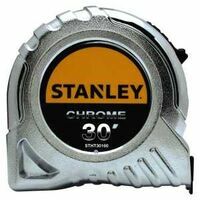 Decimal scale tape rule with die cast metal case; blade coated with heavy duty Mylar polyester film for durability. Two rivet, corrosion resistant hook stands up to continuous use. Special Tru-Zero hook does double duty as a pivot for drawing circles and arcs. Lightweight, orange, high strength case fits easily into most tape holsters. Bright yellow blade has clear easy-to-read numerals. Toggle lock is positioned for convenient operation; holds the blade securely in any position. Virtually unbreakable Quad Hook; four rivets for extra strength. Cushioned blade return. Removable belt clip. Case designed to fit your hand with a soft touch lock button for better feel and control. Orange/black rubber cushion absorbs impact and improves grip. Non-slip slide lock for positive blade locking, 10' stand-out, clearcoat blade protection 4-rivet end hook and easy on/off belt clip for fast attachment to belt. Has lots of great features that make it easy for professionals and DIYers to take accurate measurements; with a chrome plated case and a polymer coated blade, you are ensured years of heavy duty use. This tape offers 7' standout; it has a multi-catch hook for versatility with a Tru-Zero hook for accurate inside and outside measurements. Used by bricklayers for spacing brick courses. Spacing range 2-7/8" to 3-1/2" in 1/16ths increments. Brick spacings identified by black letters A-K. Rule is printed in yellow. Regular outside markings in black. Brick Masons scale on inside, red course counter numbered consecutively. Easy and fast to use by bricklayers. Graduated vertical inches to 1/16ths, both edges. Brick Mason's scale on inside, red course counters numbered consecutively. Regular outside markings in black. Easy readability with wide blade and 8' tape standout. Blade Armor coating on the first 6"; entire blade coated with mylar polyester film, 16" and 19.2" stud center markings simplify framing jobs. Smaller than PowerLock Classic Tapes, making it perfect for smaller settings. Three-rivet, corrosion-resistant hook moves for accurate inside/outside measurements. Forward blade lock simplifies locking and unlocking the blade. Wear plate protects case from cuts and nicks. Anodized aluminum construction will not rust. High visibility, deep stamped, long lasting graduations of 1/8", 1/10", 1/12", 1/16" and conversion tables; 1/8" thick. Bold red and black markings contrast against white or natural pine finishes. Clear, abrasive resistant coating, riveted lock joints, brass plated end clasps and strike plates prevent wear. Graduated slide rule extends up to 6 inches. Slide rule runs under friction in T-slot and stops at each end to prevent slide from falling out. Marked both sides and both edges. Graduated to 1/16ths of an inch, 16 inch stud centers in red, regular outside markings. Rules with hook the zero falls at inside of hook, for distance measuring. Rules with flat, inside markings; numbering begins on inside of rule. Lightweight, high strength, Hi-Viz orange case easy to find on the job; fits perfectly in the hand and into most tape holsters. Bright yellow blade has clear easy-to-read numerals with cushioned blade return. Removable belt clip. Toggle lock is positioned for convenient operation and holds the blade securely. For gauging inner diameters and transferring measurements to a ruler. Hardened and tempered bow springs assure uniform tension without side play. Adjusting screw has self-seating washer and nut for quick adjustments. Legs made from special caliper steel with hardened measurement points. Conforms to government specifications GGG-C-95. Red foot figures; regular outside markings in feet and inches. Decimal points on engineer's scale prevent reading errors. Graduated in feet, 1/10ths and 1/100ths of feet. Easy readability, 7' standout, secure blade lock won?t creep. Special Tru-Zero hook does double-duty as a pivot for drawing circles and arcs. Entire blade coated with Mylar polyester film for added durability, heat-treated spring stands up to repeated use, 16" and 19.2" stud center markings. Three-rivet, corrosion-resistant hook moves for accurate inside/outside measurements. Nylon bond blade protection; 5-point reinforced frame; fractional scale; optimized hood designed for scoring; stamped steel belt clip; lanyard ready. Used for laying out and marking angles in framing, roofing and stairway work. Also used for checking squareness and flatness. Lightweight, high strength, Hi-Viz orange case easy to find on the job; fits perfectly in the hand and into most tape holsters. Bright yellow blade has clear easy-to-read numerals with cushioned blade return. Removable belt clip. Toggle lock is positioned for convenient operation and holds the blade securely. Wide blade for easy readability with BladeArmor coating on the first 6" that maximizes durability of hook end; mylar polyester film extends life of entire blade and 11' tape standout. High impact ABS case with rubber over mold is jobsite tough, top forward blade lock, 16" and 19.2" stud center markings simplify framing jobs. Cushion grip provides comfortable, slip-resistant hold and hook grabs on side, top or bottom for versatility. Rugged rubber over-mold for impact resistance; 10' Blade Standout for reach and efficiency; Tylon blade coating for durability and long blade life; "Tru-Zero" end hook for accurate measurements; high impact case design for durability. Locates wood or metal studs up to 1-1/2" deep. Red LEDs light up every time a stud edge is approached. The SpotLite Pointing System, an audio alert, and a green LED signals when the stud edge is reached. Should scanning begin over the over-the-stud indicator alerts the user to start the scan in a new location. "TruCal" technology calibrates to any wall's density and a steady green LED "TruCal" light alerts the user when the tool is calibrated and ready to scan. Universal lightweight long steel tape with high impact polystyrene case. Yellow clad blade .005"/0.13mm thick. Easy wind nylon drum; easy-to-read black and red markings. Hook ring is retained neatly in the contoured mouth of the case. Removable belt clip. Graduated feet and inches to 1/8ths with instantaneous readings; 16" centers indicated by a diamond. Metallic ABS case has a wear plate that protects case from cuts and nicks. BladeArmor coating on the first 6" maximizes durability of hook end, Mylar polyester film extends life of entire blade and improves measurement visibility. Forward blade lock design simplifies locking and unlocking the blade, wide blade for easy readability. Three-rivet, corrosion-resistant hook moves for accurate inside/outside measurements, 16" and 19.2" stud center markings simplify framing jobs, 8' tape standout. Super-strong anodized I-beam frame with shock-absorbing end plates. Solid block acrylic vials won't break, leak or fog. True Blue vials are accurate to within 0.00005in. per inch in all 10 level and plumb working positions. The first tape to feature a unique new Lufkin design that gives users maximum control when extending and retracting the tape blade; the "Drag Strip" access opening on the bottom of the tape allows users to regulate blade feed and return with their fingertip for greater control, making the tape feel more like an extension of their arm than a hand tool; an integrated tether or wrist strap ring helps prevent drops and injuries; the 10' stand-out capacity and extra-wide end hook make this tape perfect for the toughest jobs. Color: Hi-viz orange.